A ragtag group of folks from a small town band together when the unexpected is thrust upon them. Think The Walking Dead (RV and all), but with aliens.. and sped up in time. The intersection of different personalities makes for an intriguing story of survival. There is a beautiful first visual, and perhaps an homage to Close Encounters of the Third Kind, as we are introduced to the threat. But that does not last long. In a matter of seconds, mass explosions and hysteria as a heavily armed alien army approaches the local rugby game and obliterates the scene. It’s pretty exhilarating immediately. You are invested in these folks. The alien armor is designed in a RoboCop meets Cybermen (Doctor Who) fashion. While I wasn’t a huge fan of their appearance underneath, I’ll forgive it for all the other positive aspects. Our group takes aim at not only survival but fighting back, and making a new life for others. The film pushes forward in time quickly covering a ton of story ground. The performances are great. The FX are pretty stunning. This could have easily been an entire series. Occupation is truly action-packed and phenomenally engrossing. It goes far beyond the normal invasion movie. At its core, Occupation is about humanity. 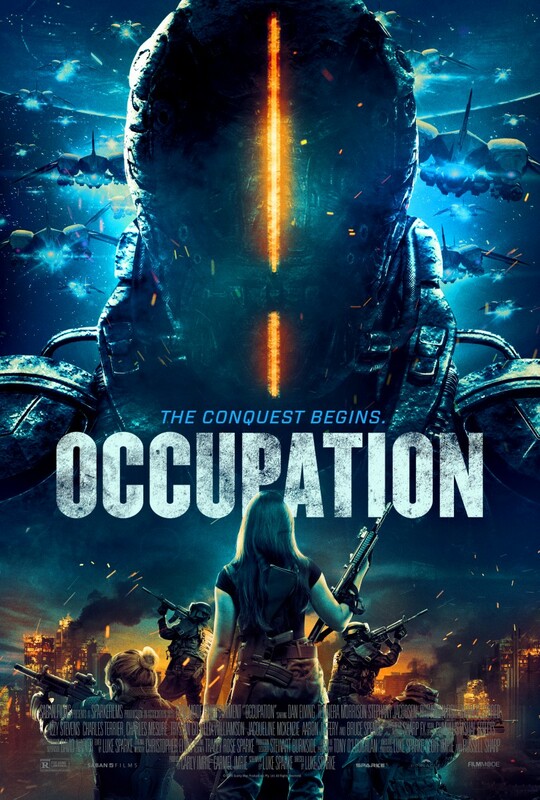 Saban Films will release the upcoming sci-fi film OCCUPATION in theaters and on VOD and Digital HD on July 20, 2018. The film was written and directed by Luke Sparke (Red Billabong)and starsDan Ewing (“Home and Away,” “Power Rangers R.P.M.”), Temuera Morrison (Aquaman, Green Lantern), Stephany Jacobsen (Alex Cross, “Terminator: The Sarah Connor Chronicles”), Rhiannon Fish (“The 100,” “Home and Away”), Zachary Garred (“General Hospital,” Marriage of Lies), Izzy Stevens (“Puberty Blues,” “Underbelly”), Charles Terrier (“Interface,” King of Ashes), Charles Mesure (“Once Upon a Time,” “The Magicians”), Trystan Go (“Small Town Hackers,” “The Family Law”), Felix Williamson (Peter Rabbit, The Great Gatsby), Jacqueline McKenzie (The Water Diviner, “The 4400”), Aaron Jeffery (Turbo Kid, X-Men Origins: Wolverine), and Bruce Spence (Winchester, Pirates of the Caribbean: Dead Men Tell No Tales). This entry was posted in Liz, Reviews and tagged dan ewing, luke sparke, occupation, Saban Films, sci-fi by Liz Whittemore. Bookmark the permalink.